where the end is going to be..."
My Sunday was a quiet one but I did manage to sneak a couple of productive things in. I organized my storage containers; keeping only those with matching lids, disposing of the ones that were cracked or damaged, collecting the others to see if anyone on freecycle would be interested. I finished reading Glamping with Mary Jane. I devoured it in two bedtime sessions. Boy is it ever inspiring! And daunting!! I have to admit I would love to have my own little Glamper. I'll have my own Gypsy Caravan all planned out by the time I can actualize it. In the meantime I'll be more than content with glamping out my tent. 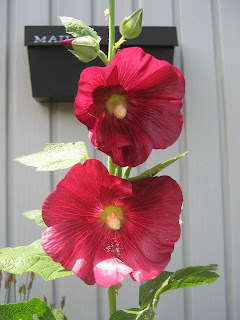 On another note, there are these stalwart hollyhocks blooming away in my front entry. They are a reminder for me that amidst the chaos one can still find beauty.